2) Border marker 135, CH on right, D left of marker. At this point the border crosses the road where the road makes a sharp right and left loop next to the Zollamt (ZA). 3) Swiss side of 135. 4) German side of 135. 5) Looking from marker 135 across the road. The border runs along the tree line and left edge of the dirt road. The car is on the borderline. 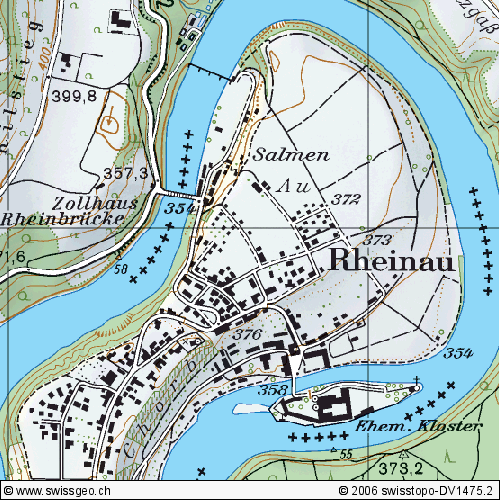 1) 1: 25,000 topo map of Rheinau, a gooseneck in the Rhein River. 3) Border marked CH right, D left, in the covered bridge. 4) German border guard on the German side of the bridge. 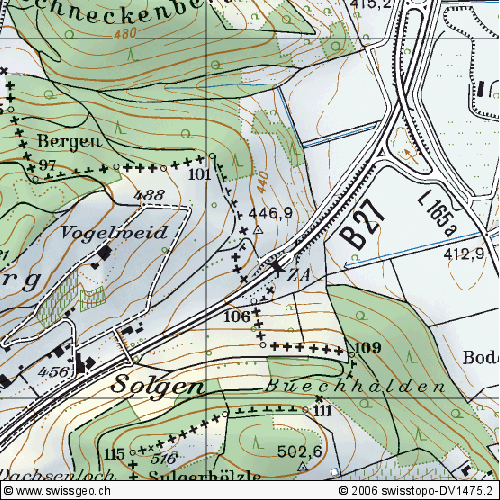 1) 1: 25,000 topo map of the main Lottstetten crossing. The topo map, while not very detailed, shows some interesting jogs at the border crossing. The stones on the ground make this clearer. 2) This photo shows a straightline segment of the border up the hill. See the border marker in upper center of the picture (#107 or 108). The border follows the small fence to the marker at the bottom center. Bottom marker is # 106. 3) This picture shows an old marker in the foreground (#106a? or 105?) and the top of the picture is the marker at the bottom of the first photo from left (#106). 4) A closer view of the old marker (#106aor105 (? )), which shows an almost 90 degree angle in the border. 1) Left--marker 105a, under the tree. It shows another nearly 90 degree angle in the border. 2) Middle--marker 105a, the German side. 3) Right--maker 105a, the Swiss side. At this point the border cuts acutely across the road, and both Swiss and German customs are located completely inside Germany. 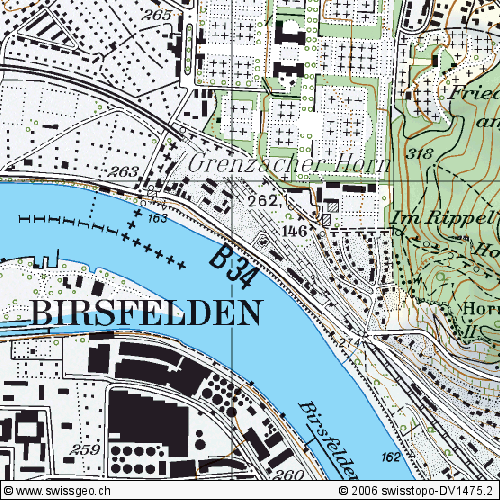 1) 1:25,000 map shows a small square(ish) protrusion of Germany into Switzerland at Basel. 2) Border marker #151, very near the shore of the Rhein River. 3) Another view of the same marker. These two pictures were taken from the German side. 4) The Deutschland sign, but the stone under it is NOT a border marker--rather it is a mileage marker telling how far it is to Basel. The border is behind me about five meters. 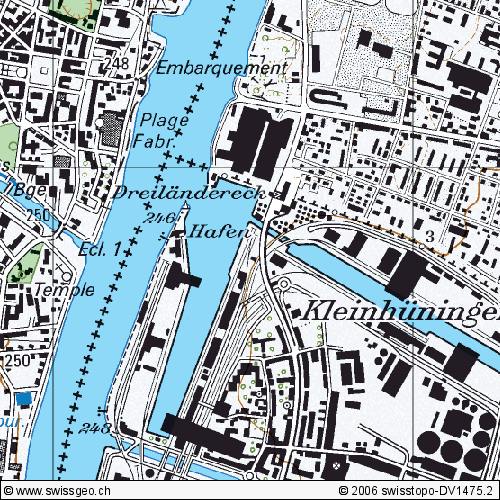 5) The yellow line marks the exact border across the road along the Rhein. 1) This view is north of the yellow line in the photo above. The border goes over railroad tracks and is marker at its NW corner with this old marker (#149) very near the rail line. I'm standing on the tracks taking the photo...there was not border marking on the rail line. 2) The marker up close (#149). The border takes a 90 degree jog to the right (east) from this marker. 3) The top of the marker showing the border turn to the east. 4) Looking from the line from the east back toward marker 149. 5) In this shot the border is heading east between the road and the fence. The road is in Switzerland, the gardens are in Germany. 1) This shot is looking back the other direction (westward) further down the border road. At this point the border is in the grass just to the left of the road. 2) Similar shot further west. The border is marked with a yellow blotch on the tree. 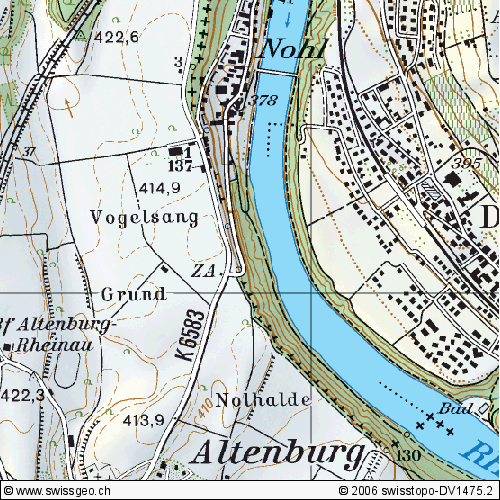 1) 1:25,000 map of the Dreil�ndereck (tripoint meeting of France, Germany & Switzerland). On the map, the two connected black blotches on the German corner is a shopping center with large supermarket. 2) This picture shows the end of the Swiss-German border fences from the German side. Also, note the Swiss surveillance cameras. The fence is Swiss and is located exactly against the borderline. In the background, the Dreil�ndereck monument is visible. It is entirely on Swiss territory but commemorates the meeting place of all three countries. 3) The end of the fence going down into the Rhine River. 4) A better view of the Dreil�ndereck monument. 1) This is border marker #1, the first marker along the Swiss-German border. It is located about 50 meters in from the shoreline. Not how precisely the fence is built by the Swiss to the middle of themarker. 2) Border marker #1 from the other direction. Both of these pictures were taken from the German side.